myCooper (http://my.cooperhealth.org) is a secure, online tool that connects you to your electronic medical record (EMR) from the privacy of your home at any time, day or night. The information is encrypted, which means it is stored in such a way that it can only be unscrambled after you enter the correct password. 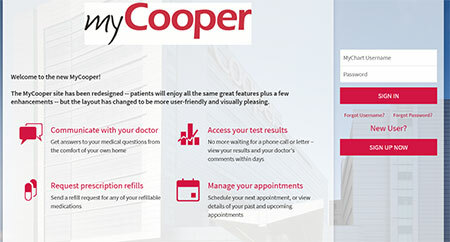 Access your Cooper medical records – anywhere, anytime. Review your medications, immunizations, allergies, and medical history. Receive the majority of your lab results from LabCorp, Quest, and Cooper online — no waiting for a phone call or letter. Communicating with your physician’s office staff for non-urgent matters is as simple as sending an e-mail — but even more secure.